This new retelling of the 1991 animated classic follows within the bounds of the original story with a few exceptions that give this extravagant film a different set of legs to stand on. For instance, screenwriters Stephen Chbosky (The Perks of Being a Wallflower) and Evan Spiliotopoulos (2014’s Hercules) give audiences new insight on Price Adam (The Guest’s Dan Stevens) before his royalty was stripped away by a curse. The context gives the Beast perspective that only the original film only glossed over. The same happens for Belle (Emma Watson of Harry Potter fame), only we find out a bit more about her father (Kevin Kline) and her mother. The results are fresh, attractive, and nice yet simultaneously puffy since it takes double the amount of time to cover more iconic scenes and choreography. 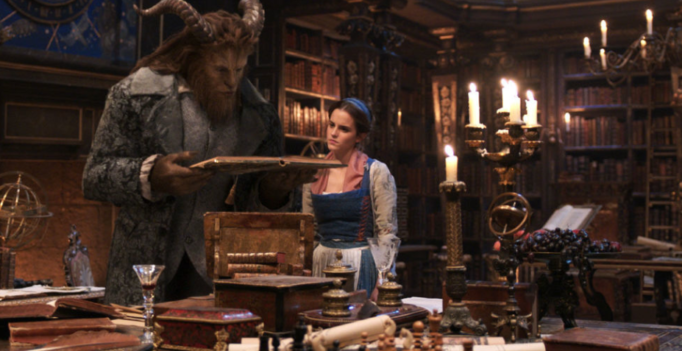 However, what I really admire about 2017’s Beauty and the Beast is that it acts as genre school for young movie goers. Underrated director Bill Condon (Dreamgirls, Mr. Holmes) does a great job of separating the individual styles that make up this story. The musical numbers show this eager crowd how basic theatrical elements can be applied to film, the romance is accessible to see how potential love interests find common ground despite their differences, horror is illustrated well during intense sequences in the woods, and – most notably – the physical history on screen gives young audiences an introductory course on period films. Sure, I may be looking too hard at a movie that’s simply here to tell a cherished story to a new generation, but I really think these cinematic pieces are going to stick with youngsters who came for different reasons.